In general I am not a big fan of regional cookbooks, too often they are either dry scholarly tomes written by home economics professors or mass media food fad hack jobs like the innumerable "Cajun" cookbooks that came out during the "blackened" food craze. Part of the problem I suspect is that old regional folk dishes are regional for a reason. It's not that they are "bad" per se, but they can be an acquired taste and often use ingredients that are difficult to obtain outside of their region. Regional recipes also tend to be strongly associated with local ethnicities, and herein lies the rub. Although most people claim to be proud of their heritage, the vast majority of Americans historically eschew things that are stereotypically associated with distinct ethnicities and or social class. With the greater emphasis on diversity this is slowly changing, but unfortunately many folk recipes are already forgotten. Chefs too often focus too heavily on creating a "new" taste and ignore local traditions (Dill in clam chowder is one of my pet peeves). 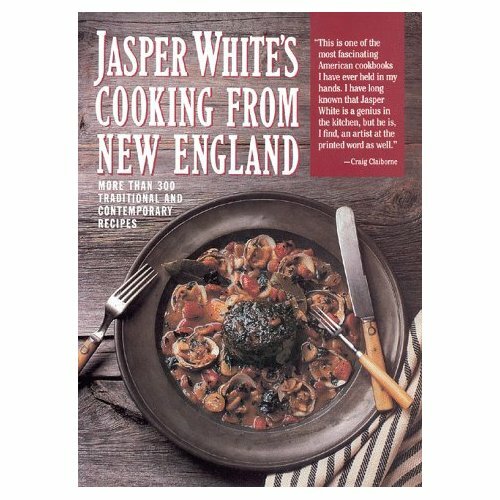 White's book is the happy exception, it's well written, contains both strictly traditional and adapted recipes and he explains local ingredients and traditions almost reverently. I suspect this is because Jasper is originally from New Jersey and came to this food later in life. In any case, this book has recipes you simply can't find anywhere else. A good example is "Red Flannel Hash", although we just called it hash as a kid. I hadn't thought about this dish or had it in possibly 35 years and I have NEVER seen it on a menu. Red Flannel Hash is basically left overs from a New England Boiled Dinner (also in the book). The corned beef and veggies are mixed with pickled beets and spuds, then chopped and pan fried until a nice crust forms on the bottom. It's wicked pissa, I assure you.